Antoine van Agtmael coined the term emerging markets and built a career and a multibillion-dollar investing firm centered on these surging economies that would, over time, supplant the West as engines of wealth and prosperity. The trend held for decades, but a few years ago van Agtmael and Alfred Bakker, a renowned European journalist, began seeing signs that the tide might be turning. For example, during a visit to an enormously successful chip company in Taiwan, the company's leaders told them that their American competitors were now eating their lunch. And Taiwan was not the only place giving them this message. Thus began a remarkable two-year journey to reassess the conventional wisdom that the United States and Europe are yesterday's story and to determine whether there is something profound that is happening that points the way to the creation of the next economy. 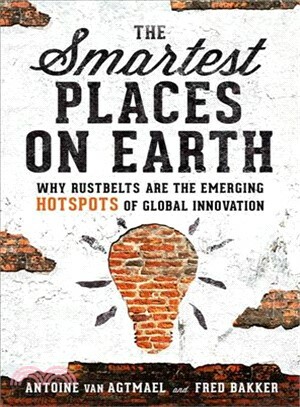 In The Smartest Places on Earth, van Agtmael and Bakker present a truly hopeful and inspiring investigation into the emerging sources of a new era of competitiveness for America and Europe that are coming from unlikely places--those cities and areas once known as "rustbelts" that have, from an economic perspective, been written off. Take Akron, Ohio, whose economy for decades was dependent on industries such as tire manufacturing, a product now made cheaply elsewhere. In Akron and other such communities, a combination of forces--including visionary thinkers, government initiatives, start-ups making real products, and even big corporations--have succeeded in creating what van Agtmael and Bakker call a "brainbelt." These brainbelts depend on a collaborative style of working that is unique to the societies and culture of America and Europe, since they involve levels of trust and freedom of thinking that can't be replicated elsewhere. They are producing products and technologies transforming industries such as vehicles and transportation, farming and food production, medical devices and health care. For several decades, American and European industry focused on cost by outsourcing production to those emerging markets that can make things cheaper. The tide has now turned to being smart, as van Agtmael and Bakker report, and the next emerging market, may, in fact, be the West. Antoine van Agtmael is a senior adviser at Garten Rothkopf, a public policy advisory firm in Washington, DC. Previously, he was a founder, CEO, and CIO of Emerging Markets Management LLC; a deputy director of the capital markets department of the International Finance Corporation (IFC), the private sector oriented affiliate of the World Bank; and a division chief in the World Bank's borrowing operations. He was an adjunct professor at Georgetown Law Center and taught at the Harvard Institute of Politics. Van Agtmael is chairman of the NPR Foundation, a member of the board of NPR, and chairman of its Investment Committee. He is also a trustee of the Brookings Institution and cochairman of its International Advisory Council. He is on the President's Council on International Activities at Yale University, the Advisory Council of Johns Hopkins University's Paul H. Nitze School of Advanced International Studies (SAIS), and a member of the Council on Foreign Relations. Alfred Bakker, until his recent retirement, was a journalist specializing in monetary and financial affairs with Het Financieele Dagblad--the Financial Times of Holland--serving as deputy editor, editor in chief, and CEO. In addition to his writing and editing duties he helped develop the company from a newspaper publisher to a multimedia company, developing several websites, a business news radio channel, and a quarterly business magazine, FD Outlook, and was responsible for the establishment of FD Intelligence.